Heat a skillet over medium heat until hot and add the pancetta slices. (If the pancetta is very lean, add 1 T. olive oil to the pan.) After 1-2 minutes, turn the pancetta once and continue to cook another minute until the fat is lightly golden, then remove to a plate and set aside. Once all the pancetta is cooked, add the asparagus to the same pan and cook, stirring often, until the pieces are crisp-tender and browned in spots, about 3 minutes. With a slotted spoon, remove the asparagus to the plate with the pancetta. If there is no moisture left in the pan add 1 T. olive oil. Add the shallots and cook over medium-high heat for a minute, then add the sherry and boil to reduce the liquid by half. Whisk in the vinegar and Dijon mustard. Remove from the heat and add the olive oil a little at a time, whisking well to make a thick dressing. 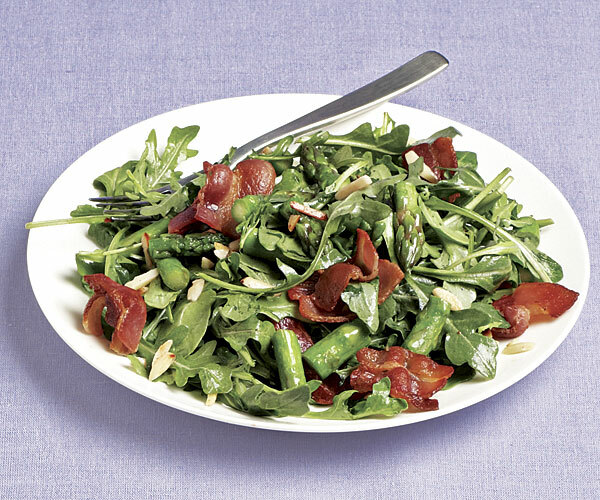 Put the arugula in a serving bowl, add the toasted almonds, asparagus and crumble the pancetta over the salad. 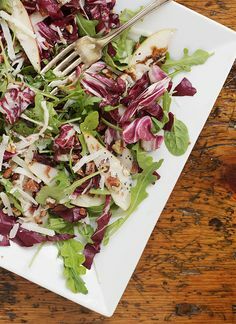 Add just enough dressing to slightly wilt the arugula, toss well and serve immediately. Serves 4-6. Make the dressing: Process beet, honey, mustard, garlic, vinegar, salt and pepper in a food processor. Process for a few seconds, then incorporate a quarter of the oil at a time. It should be smooth and homogenous. Sauté the almonds in butter and a pinch of salt for three to four minutes, then set aside to cool. Halve the nectarines, remove the stone and cut each half into three wedges. 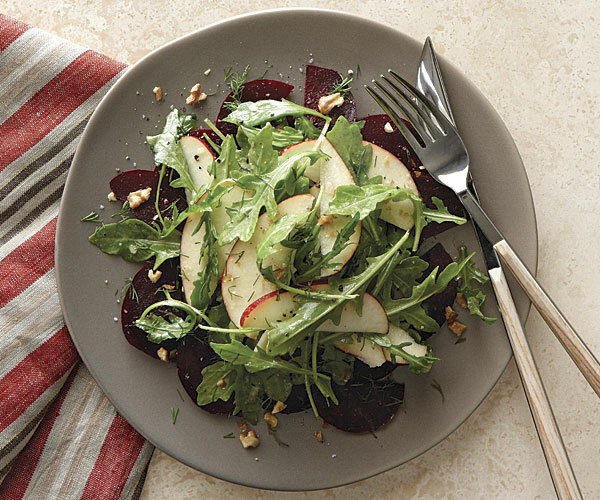 In a large bowl, toss arugula with enough dressing to coat. 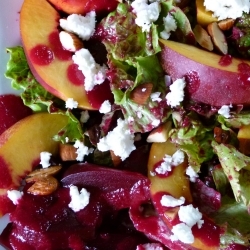 Spread dressed arugula on a large platter; arrange nectarines on top; drizzle with remaining salad dressing; top with almonds and gorgonzola and serve.